I have what I believe is a '56 Fordson major. Engine serial number is 1374476. I've had this for 15 years and has worked great. Recently developed a 'tick'. I took the head off and found a valve was stuck and broken. The injector is beat up, the valve seat area between the two valves is bad. I also found where it must have been 'fixed' between two valves on another cylinder before I bought it. Long story short, I need a new head, but I am not finding one with internet searches. You guys have any ideas/suggestions on where to get one? According to the serial number the tractor is a 1956 New Major. From what I can tell the cylinder heads from the power major and super major might fit. They all have the same bore and stroke. The major had a different engine. Interesting on the model in that it may not be what I thought I had all these years, but I didn't see that in the book he had either. strange. Again, thank you guys in advance. I have also found out that the ford 5000 1962-1964 was imported from Dagenham, England and has the same engine as the Super Major. 3.6 liter and same bore and stroke. I don't know if any real changes were made from the new major. This could be in the injection pump or metering, but the compression ratio is the same for all three new major, power major, and super major. For some reason some books don't list the new major engine. The older major had either an all fuel four or a 6 cylinder modified Perkins. I cannot find much about either except bore and stroke. The major (1945-1952) is listed as having 4.4 liter with low compression head. 4.125 inch bore and 5 inch stroke. The Perkins is listed as 3.5 inch bore and 5 inch stroke, but it is 6 cylinder at 4.7 liters. The best thing to do is to measure the bore and check the stroke on yours to make sure you don't have the older model. 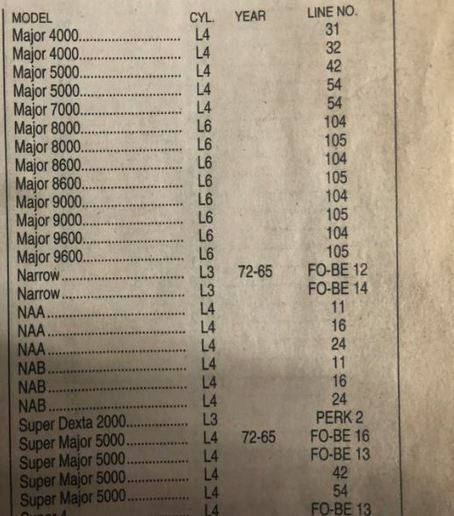 The horse power and pto power were checked at different rpms and there was no pdf file for the 'new major' to compare it to the Nebraska tests run on the power major and super major. The tests I saw on the nm and sm showed the same pto power. I am running into conflicting information on the E1A New Major so you are going to have to check the bore and stroke to double check the information. In my previous post I used the abbreviation nm and sm. I should have used pm for power major. I did not mean nm or new major. It is the new major I could not find a Nebraska test pdf file on. The Fordson, 1945-52 is the E27N. It's the old 1917 flathead engine with some improvements. New Major has overhead valves. Diesels were 220 cu in. Gas was 200 cu in. There should be a good head on the back hoe that throe a rod. I can get it off if it ever warms up here in Ohio. The stroke measured 4.5", the bore is about 3.915". Does that define which of the majors it is in the pictures below from the book? Thanks. Do you think this would be a direct replacement/fit? The machine shop is cleaning the one I had up to confirm no cracks etc before they determined if they thought it was repairable. How much would you want for yours? The bore and stroke match that for the New Major, Power Major, and Super Major. My brother in law thinks the springs are way too weak. does anyone know the specs for the valve springs? I am getting close, head is good. thank you all!